This Country Evaluations section contains original documents about crucial nuclear issues in Lithuania and several Russian regions. It also provides information about how ECOLOGIA staff in these countries foster public participation and help to find productive solutions to social, economic, and environmental issues in nuclear communities. 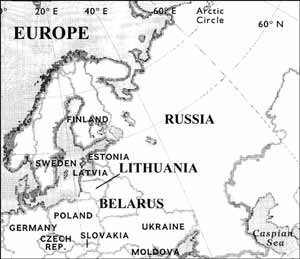 To learn more about the nuclear questions facing Lithuania or Russia today, and ECOLOGIA's methods of finding constructive solutions, click on one of the countries in the side bar at left. Between 1999-2001, ECOLOGIA also conducted project work in the Republic of Belarus. To learn more about nuclear issues in Belarus, and ECOLOGIA's accomplishments there, click here.